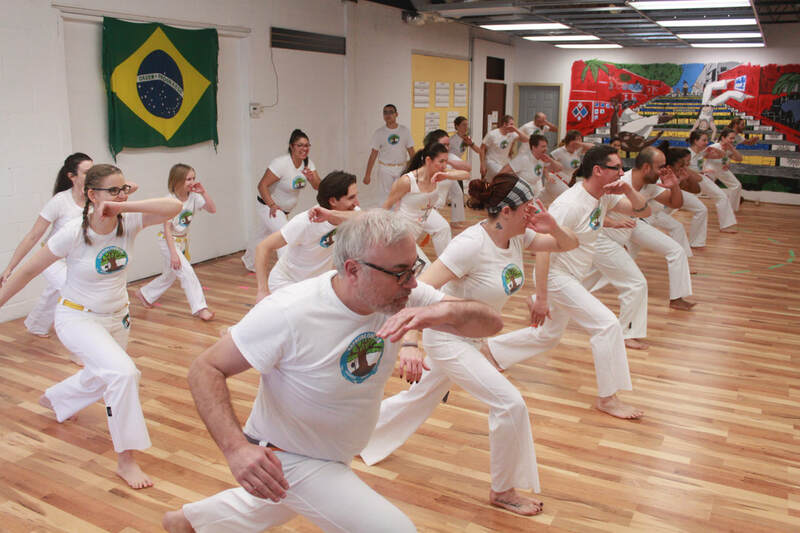 Whether you are just beginning your wellness journey or are looking for a way to add variety, flavor or a challenge to your existing routine, capoeira has something for you! We welcome new students at all times throughout the year. New students are encourage to contact us (see the Contact Us tab) or stop in to schedule a first FREE class to give capoeira a try. Generally we set this up during a LEVEL ONE/ BEGINNER class (see schedule). Also available for beginners are ALL LEVEL classes, as well as CONDITIONING and MUSIC classes. Not sure capoeira is for you, yet would like to benefit from a great workout? Try our conditioning classes! While based in martial arts training methodology, there is no experience required to participate in our conditioning classes. Come try out a class and learn how to hit some pads, gain strength and flexibility, and get a cardio workout- all while incorporating some basic capoeira movements. If you enjoy your first class, we offer a first introductory month at a reduced rate! Be sure to inquire. We can't wait to have you give capoeira a try! We offer a variety of flexible training packages to help you achieve your goals. New students may attend their first class for free, and can take advantage of a discounted introductory month of classes. Contact us for more information on our regular program and class rates, and to inquire about our special family rates.